This palace located at Via Vittoria 6 was built as an Augustinian convent; it was formerly called the Palazzo del Monastero delle Agostiniane. Today the palace houses the Accademia Musicale di Santa Cecilia. The doorway on the right in the photograph (with the pointed pediment) is the entrance to the Accademia. 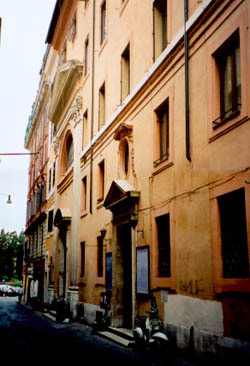 The doorway on the left (with the rounded pediment) is the entrance to the former church of the convent (now used as a concert hall). 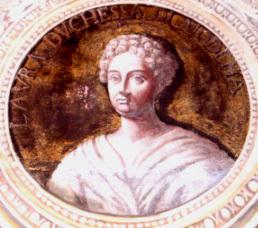 In 1684, Duchess Laura of Modena (mother-in-law of King James II and VII) founded an Ursuline convent in the building. In January 1781 Queen Louise installed herself here after separating from King Charles III in Florence. She remained here some three months until Pope Pius VI permitted her to live in the Palazzo della Cancelleria. Formerly there were several tablets in the building recording the residence here of Queen Clementina. These were removed by the Ursulines when they vacated the building late in the nineteenth century. 2 One of these inscriptions is now in the Ursuline convent at Via Nomentana 34. 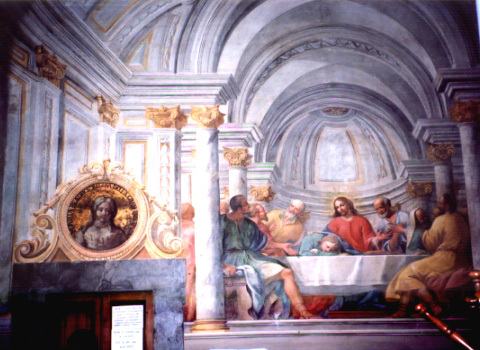 The library of the academy, formerly the convent refectory, is beautifully frescoed. Above the doorways on the south wall of the room are fresoced grisaille portraits of Queen Mary Beatrice (wife of King James II and VII) and of her mother Duchess Laura of Modena. 1 Amy Vitteleschi, A Court in Exile (London: Hutchinson, 1903), I, 111. 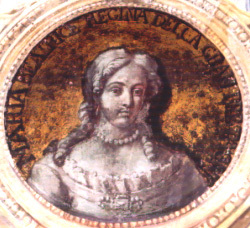 2 Vitteleschi, I, 103: "There are bare spaces on many of the walls, against which were tablets recording the visit of Princess Clementina, and being too highly prized by the sisters to be left where they had been placed as a souvenir of affection, when they were given notice to quit, they were carried away with them". Image 1 (Facade): © Noel S. McFerran 2001. This page is maintained by Noel S. McFerran (noel.mcferran@rogers.com) and was last updated November 10, 2003.